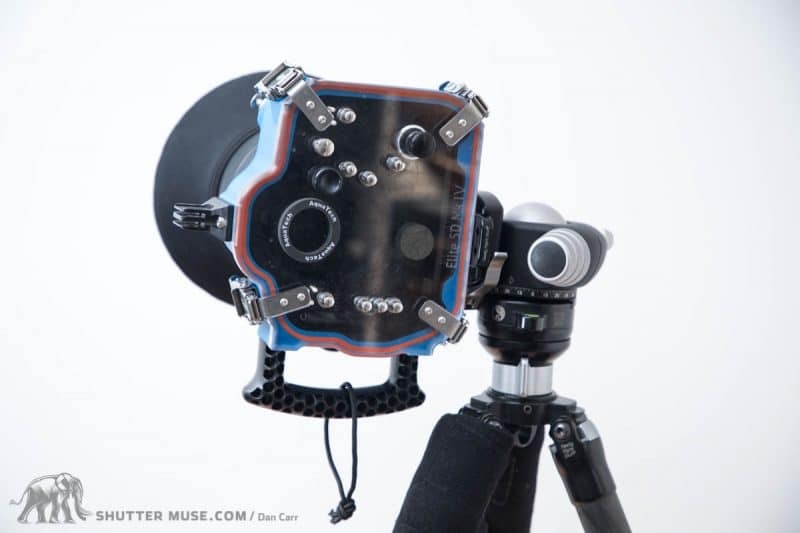 Aquatech underwater housings were primarily designed to be waterproof housings for surf photography, but I’ve come across a lot of photographers using them for all kinds of other purposes. 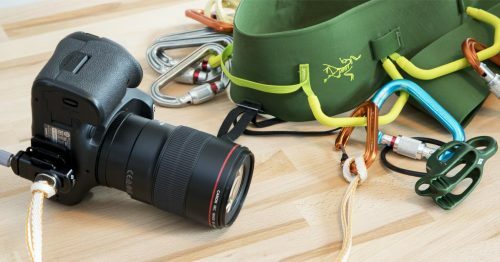 The housings are built to be extremely tough so they work well as protection for remote wildlife cameras, and there’s many other water sports that can also benefit from the in-the-water angle. One of the things I’ve also been investigating is the possibilities for landscape photography that shows you what is above and below the water. The weight of this setup makes it unstable in this configuration. This requires mounting the housing on a tripod, and as simple as it sounds, these things weren’t really meant for that, so it did need a little thought. Occasionally I also found myself wanting to mount the housing on a monopod so that I could dunk it under the water from the shore, or from a boat. Using a camera in a water housing for under/over style landscape images is definitely no easy task, and this won’t be the only challenge to overcome. There’s also the issue of tripod vibration caused by running water, and the extreme depth of field that’s needed to have sharp focus on the underwater foreground and the overwater background. This latter issue will likely be best solved by focus stacking. Two images being taken at two differing focal points to capture each piece of the puzzle, and then merged together in Photoshop or some other similar piece of software. For best results, this requires a tripod to make sure the two frames can be easily merged, and it also makes it easy to bracket the exposure so that an underwater exposure can be blended with an overwater background exposure since it’s likely to be much darker down below. The first thing you need to do is convert the 3/8 16 threaded socket on the bottom into 1/4 20, using a reducer bushing like this one. Some tripods have 3/8 16 studs, but 1/4 20 is much more common for stills cameras. At this point you could screw it directly to a tripod, but I’m going to guess that the vast majority of people who are forking out for an underwater housing, also have some sort of quick-release clamp on their tripod. This means you’ll want a compatible plate on the housing as well. Due to the overall weight of the housing and camera combination I found that smaller standard plates with rubberized anti-spin pads on them just didn’t cut it. 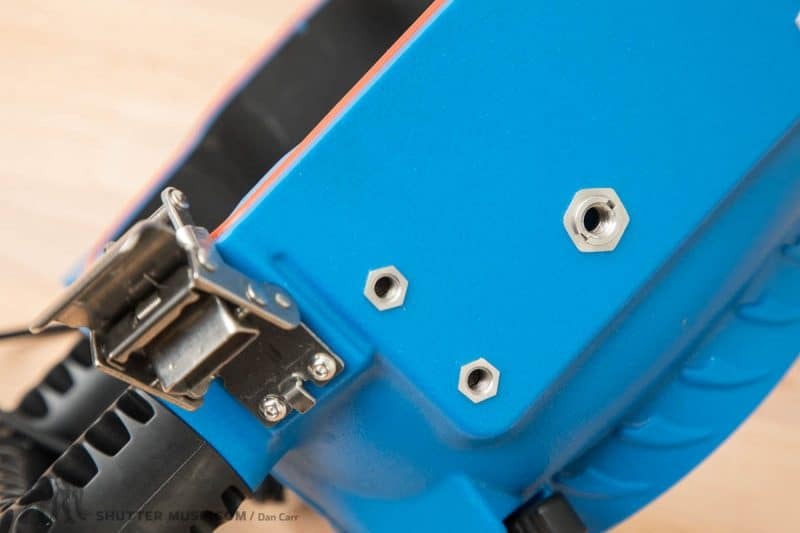 I use Really Right Stuff ballheads which have Arca-Swiss compatible clamps, and I found that I needed to get a plate that had an anti-twist flange on the end of it. This particular one in the photos is the RRS L84. You might also want to apply some Loctite if you don’t plan to remove the plate very often. This covers using the housing in a landscape orientation, but I ran into issues when flopping the camera into a ballhead drop-notch to put it into portrait orientation. The heavy weight of the setup really unbalances the tripod, and in some situations you might find that the housing fouls on the tripod. A gigantic L-bracket would solve the problem, but no such thing exists without building it yourself. RRS PG-02 gimbal instead of ballhead. 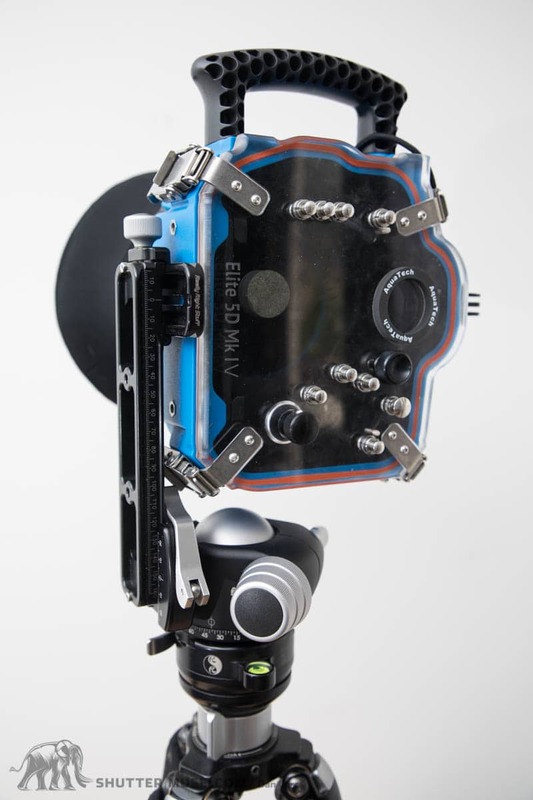 The best solution for getting the camera into a vertical orientation is to use a side-mount gimbal head such as the Wimberley Sidekick or the RRS PG-02 (the PG-01 is simply not strong enough to handle the housing weight, trust me, I tried it). 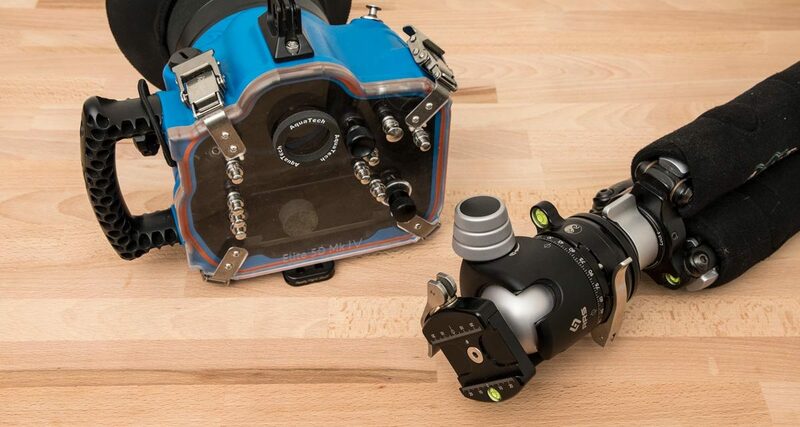 This might be seen as a costly option for such a niche purpose, but quite a few people might already own a gimbal and perhaps simply hadn’t considered this specific application. Using the gimbal keeps the weight of the camera setup centred over the middle of the tripod, which greatly increases stability. The second solution was to use a panoramic photography rail that I also had already. 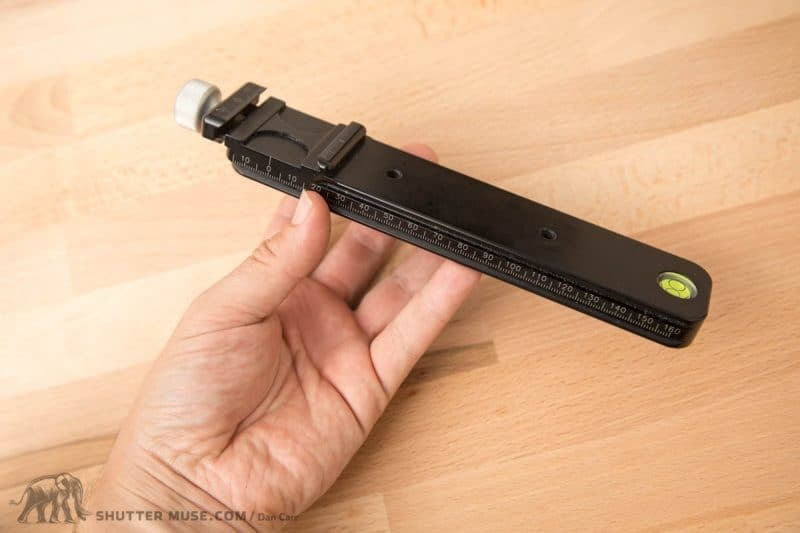 The rail is about 8 inches long, and it has a built-in clamp on the end of it. With the ballhead in the drop-notch, the rail is simply used to raise the housing up, keeping the weight of the setup over the top of the tripod. 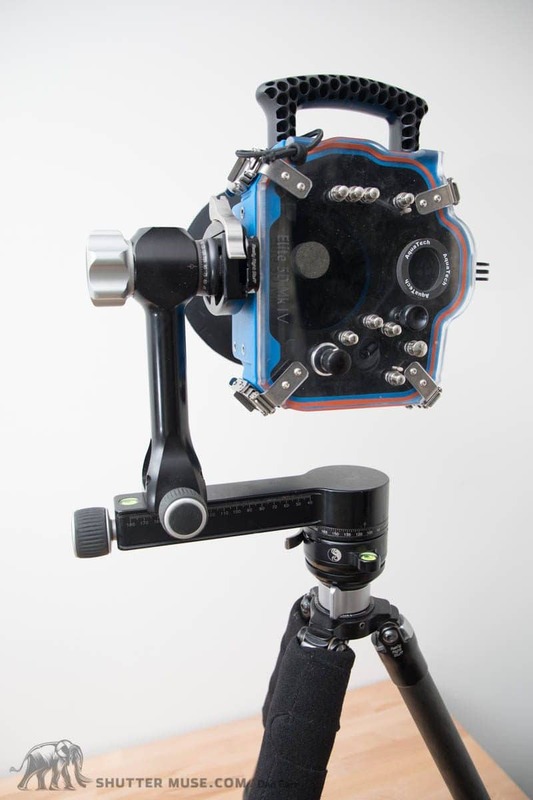 If you don’t already own a gimbal, a pano rail like this one is going to be the cheapest solution to purchase. You can get them from various people, but mine is the RRS MPR-CL II. As you can see, I found a couple of solutions amongst the gear that I already owned, and I could probably MacGyver a few more together if I had a rummage in my toy box. 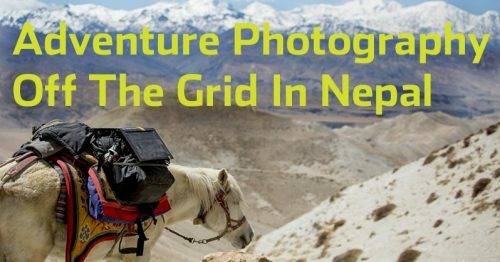 I’m definitely not calling this the definitive list of ideas, merely divulging my own options in the hope that it sparks some inspiration for your own solution. Like I said earlier, if you do have your own solution, I’d love to hear about it in the comments below! It goes without saying that in general, ballheads are not meant to be submerged! Do this at your own risk, and make sure you understand they need to be thoroughly dried out afterwards, and you might need to re-lubricate them. It’s possible that you’ll end up with some water trapped in the ball of the head because they are often hollow… you have been warned! Proceed with caution, and maybe use an old ballhead if you have major concerns. Just an FYI. Even after talking with Aquatech support and confirming a tripod setup was possible, I received my elite housing today and they no longer have the center socket on the bottom. Really?? There’s literally no 1/4 20″ hole on it at all now? Did you call them? Maybe you got an oddball one? I can send you a photo. It’s a smooth flat bottom. Pre-sale, the customer service agent on chat told me I just needed the reducer bushing as you described in this post. 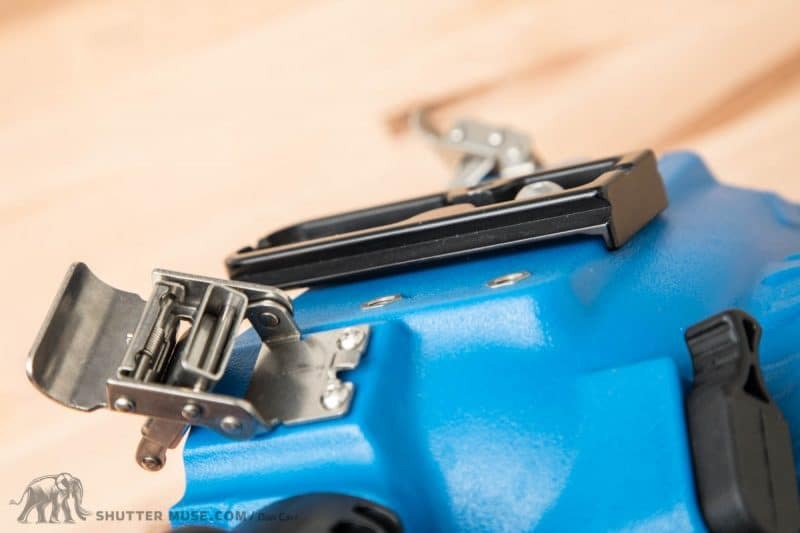 After sale and receiving the housing with a flat bottom without any holes, customer service now informs me that all new housings only have the 4 m5 sized holes in the corners for the pistol grip. They also gave me an Allen key in the box for a flat head slotted screw used on the camera plate… so there seems to be some confusion and transitions with the product design? Yikes. I wonder why they would remove the tripod mount option. Maybe they could create a tripod mount adapter that uses the 4 grip screw holes. 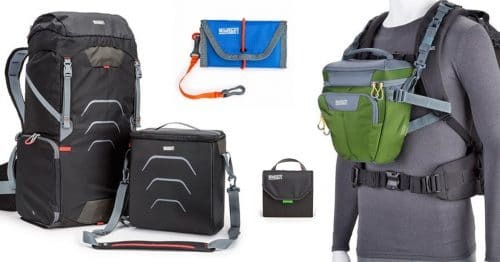 B&H has exactly that but discontinued. Just came across this looking for a base plate screw for my housing and you are a legend. Haha, thanks Justin. Glad you found it useful.